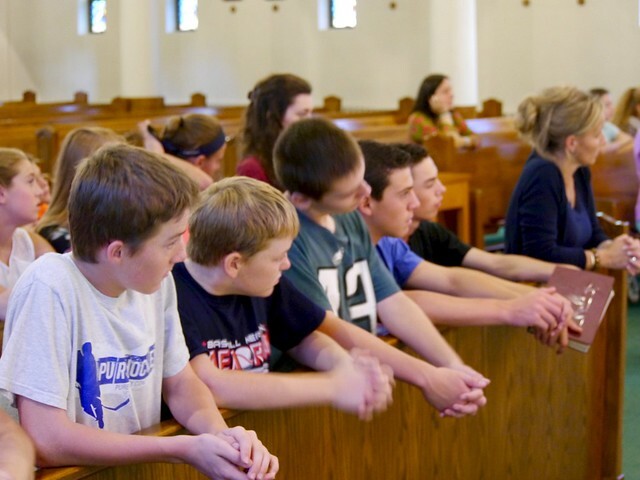 All this week, 51 middle school children from Blessed Sacrament and St. Mary parishes have taken part in a new summer session faith formation program, an intensive week that includes daily Mass and a new curriculum from Ascension Press called Altaration that invites teens to appreciate the awesome beauty and mystery of the Mass. On Thursday, the group participated in daily Mass at Blessed Sacrament and then walked in a pilgrimage 1.5 miles to St. Mary church for Adoration and Benediction of the Blessed Sacrament. During the school year, instead of weekly classes, the children have committed to weekly Mass attendance and a series of group gatherings.